Internal data from Shoeboxed, a scanning service that scans receipts and business cards into online software for its users, shows that the majority of it’s users would have spent over three hours per month organizing their paper receipts if they did not outsource the work. Managing paper receipts is time-consuming and costly for small businesses, and many solutions exist for trying to make the process more efficient. Instead of doing it by hand and filing your receipts in an accordion file or buying a receipt scanner to scan receipts yourself, it is worth considering what the real costs and the opportunity costs of these solutions are. With Tax Season 2009 right around the corner, it is worth considering how you can get your receipts organized so that you can claim the highest amount of deductions on your tax return and prepare yourself for defending an audit. 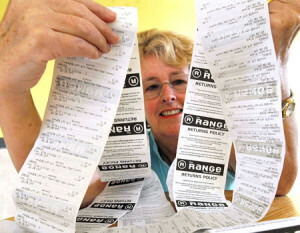 Organizing all your paper receipts into a workable system (i.e. chronological, alphabetically, or categorically), can take hours or even days of your time. Most small businesses generate several hundred receipts per month, and the time involved translates to some pretty serious labor costs. If you have admin do this for you at $9 per hour, you could easily spend over a hundred dollars a month. You also need to consider what the end result would be if you filed all your paper receipts in a physical folder. You would have them all there, but you would also have to invest more time trying to find or reference the ones that you need because there is no good way to search through them later. And it only takes one careless employee or natural disaster to ruin the organization that you spent so long creating. If you don’t already have a scanner, there are many out there in the market designed specifically for receipts. These range from smaller, portable scanners like this one from Amazon (at $119) to more expensive Neat Receipts scanners (around $200-$500) that come with optical character recognition technology. Though the scanning generates a digital copy that you can keep on your hard drive, you definitely need to consider that the scanning does take quite a while if you have a lot of receipts. Plan to spend at least 20 seconds per receipt if you’re handy with a scanner, and a little longer if you are just getting started. Also, remember that hardware and desktop software do not last forever, and you’ll have to replace or upgrade both in the future. To save time and eliminate the need to scan receipts in-house, Shoeboxed.com offers a service whereby you can mail in receipts and business cards to the Shoeboxed processing center. They will be scanned for you and entered into online software that you can access from your computer. Shoeboxed plans start at $9.95.